Seated in the heart of the Treasure Coast, this month’s Spotlight Interview takes us to Vero Beach, Florida – home of the Indian River Lagoon, the historic Old Indian River County Courthouse, a Disney resort, and the Ion Teen Science Café. Woodrow Peterson joins us to share a bit about bringing people together, life in a small town, as well as great advice for starting a new teen science café. TSCN: To start off, please, tell us in a nutshell about your Teen Café program . . . what’s special or unique about it? WP: Our program is called the Ion Teen Science Café. Our teen café events are collaborative efforts that are held in Vero Beach, Florida, and local surrounding areas. 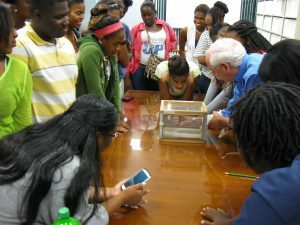 Our program is somewhat unique because we are the only teen science café located within the Treasure Coast Florida region, an area that spans approximately 100 miles along the coast of Florida between Brevard and Palm Beach County. Although there are a number of schools, colleges, and universities spread throughout this stretch of land, distance and logistics require the Ion Science Café to implement creative ways to bring people together. TSCN: Tell us a little about your background . . . how did you personally come to be involved with your Teen Café program? WP: With the support of the Teen Science Café Network, the Ion Teen Science Café was launched through the efforts of a handful of extraordinarily motivated scientists. As a team, we recognized the importance of developing relationships with students, teachers, parents, and professionals within the community. Initially, I was focused on coordinating science cafés geared toward adults. Although we had very little difficulty attracting an audience, we realized that the adults were already interested and engaged in science and science learning. Many of the adults inquired about ways to pass this interest along to their children and grandchildren. Around that time, the science café coordinator at NOVA/ScienceNow! suggested that I check into the Teen Science Café Network. Through the assistance of their Small Grant Program, as well as extensive access to start-up resources from the Teen Science Café Network, the Ion Teen Science Café was born. TSCN: What is the biggest stumbling block you have encountered as your program has developed? WP: Especially in a small town, school ties can be pretty strong. It can be a challenge to effectively draw in students from different schools, as well as speakers from various non-affiliated colleges, universities, and other organizations. In addition, we must constantly find new ways to welcome those who are unfamiliar with the science café concept. 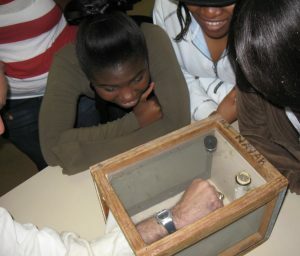 We really try to spread the idea that learning about science through hands-on activities can be fun! TSCN: What was your favorite Café? What made it so? WP: We offered a presentation featuring an evolutionary biologist and a physician. While introducing the tools of their trade, the speakers presented the topic: “Zombies: Science?… Fiction?…” Attendees particularly enjoyed an introduction to neurological assessment, as well as scientific video footage of a few parasitized, mind-controlled insects. The science was more fascinating than the fiction. TSCN: In general, what do you like best about your program? 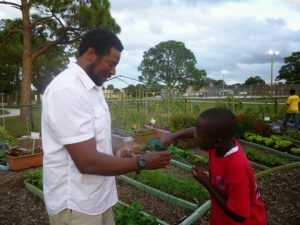 WP: I was fortunate to have been introduced to hands-on science at an early age. For me, it was a fun, engaging, and discretely educational experience. As an adult, I enjoy having the opportunity to “pass the torch” and share this form of inquiry with others. Hands-on learning at its finest! TSCN: As a veteran in our program, what advice do you have to those just starting their own Teen Cafés? WP: Start building relationships even before you’ve officially decided to start your own science café. Find out what the local climate is, and explore the science views and interests of your local community. Maybe even offer a few events before committing to a permanent series. The things that you discover may help alleviate potential challenges before they arise. Thank you, Woodrow, for taking the time to share your insight with us. That is unique and valuable advice, especially for our new members!